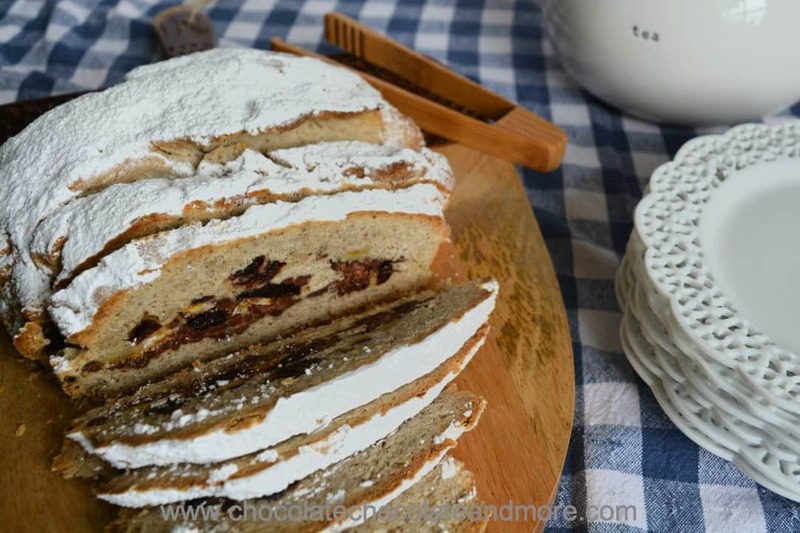 Black Forest Stollen - Chocolate Chocolate and More! Cherries, Chocolate, and citrus brighten up this German sweet bread. Black Forest Stollen keeps well so you can make it ahead or serve it warm. I really enjoy the more relaxed pace of the holidays. Spending time with family and friends just catching up. Of course a lot of that time is spent with food. Breads are great for the holidays. You can make the dough and ignore it while it rises. Then go back and bake it. The smell of fresh baked bread is wonderful. It fills your house with such warmth. 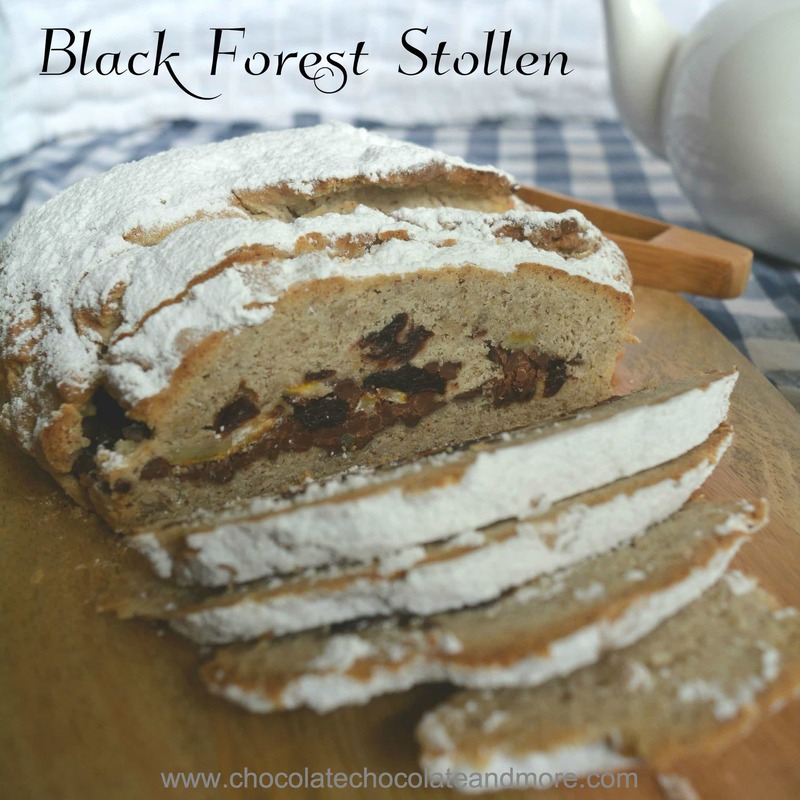 Black Forest Stollen is sweet but not too sweet. So many holiday foods are really sweet that it’s nice to take a break from high intensity desserts. The nutmeg complements the chocolate, cherries and citrus. I adapted this Dresden Stollen Recipe. My kids don’t like raisins but they love cherries and I happened to have some dried cherries in my pantry. I also had pecan meal on hand instead of the required almond meal. You can buy nut flours from King Arthur Flour or Bob’s Red Mill Flour. If you grind your own, be careful not to make paste out of it. Instead of kneading all the ingredients together, I pressed my dough flat and spread the chocolate, cherries and citrus on top. Then rolled it like a jelly roll and pinched the ends together in a circle. This keeps the cherries on the inside so they don’t dry out while baking. This recipe also gave me a chance to use my new Etekcity kitchen scale. I’ve been wanting a kitchen scale for some time. Professional chefs and Europeans use weights instead of our English volumetric measuring system. It’s much more accurate and gives you better results. I have an antique laboratory balance a friend of mine gave me when University of Texas was closing down a lab. It’s quite accurate but not really intended for large quantities used in baking. I also don’t quite trust the surfaces (even though chemists typically use weighing paper). This Etekcity scale is so easy to use. I didn’t even need to read the small manual that comes with it. Just press the button on the right to turn it off and on. The button on the left changes from grams to ounces. It comes with a stainless steel bowl and it looks attractive on my counter. It takes 2 AAA batteries to run but those come with it so it’s ready to use right out of the box. I’ve been using mine to make truffles, cakes and bread for several weeks. You can also use this for portion control if one of your New Year’s resolutions is to lose weight. Even better Etekcity has donated one for us to give away to a lucky fan. 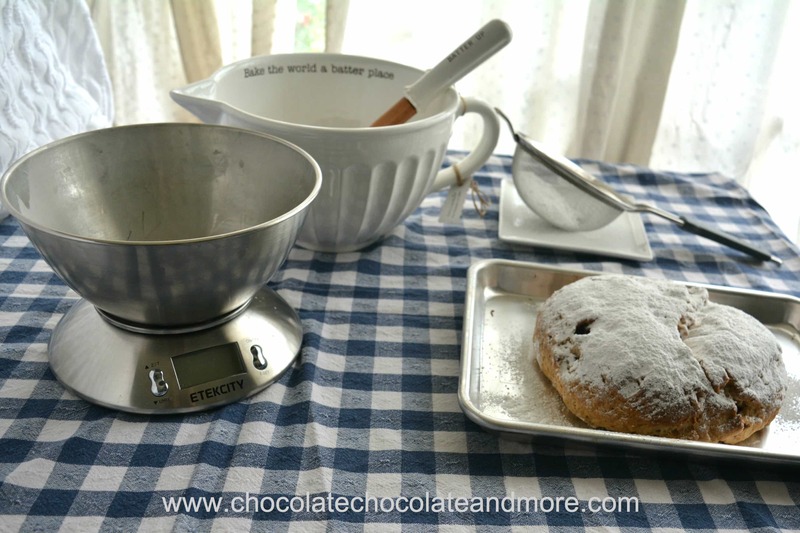 I’ve provided weights so you can use your Etekcity scale to make Black Forest Stollen. Soak cherries in brandy or water overnight. (If you're using water, you can heat the water and soak the cherries in hot water for about 30 minutes to speed up the process). Combine flour, nut flour, yeast, sugar, salt and nutmeg. Add milk and butter to form a smooth yeast dough. Knead in some additional flour to make it smooth. Let rest 1 hour. Lay on floured surface and pat into a flattened oval that's about 1.5 - 2 inches thick. Spread cherries, orange peel and chocolate chips on top. Roll up like a jelly roll and then spiral into a circle and pinch the ends to seal. Bake for about 1 hour in preheated 350° F oven. 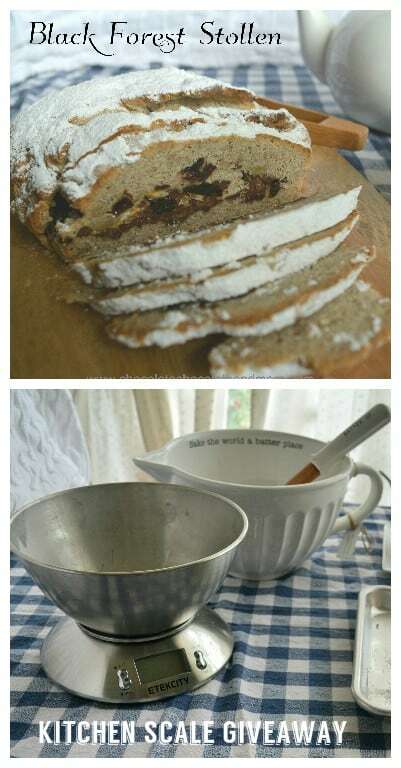 After baking the Stollen, brush them with melted butter and dust generously with confectioner's sugar. In traditional stollen, you knead the cherries, chocolate chips, and orange peel into the dough. Some of your cherries will end up on the outside of the loaf and they can get crisp during the baking, I wanted to keep mine moist so folded them in as indicated. Black Forest Stollen, IT seems delicious, thanks for your thread. In Germany we call it “bread” – not Stollen! Stollen is like your adapted Recipe. Thanks for stopping by Birgit. I have several German recipes to try so I hope you come back.